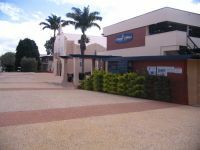 St Thomas Of Villanova Catholic Parish School catering for students from Prep to Year 6, is situated in the town of Mareeba in the Cairns Hinterland, approximately an hour's drive west of Cairns. The town of Mareeba (a local indigenous word meaning 'meeting of the waters') and the surrounding shire is home to tropical rainforests, savannah woodlands, national parks, rivers, waterfalls, granite mountain tops, gorges, escarpments and limestone caves. Prior to European settlement, it was a meeting place for the local indigenous people of the area, the 'Kuku Muluridji'. Presently our enrolments include a significant number of students with diverse cultural backgrounds including indigenous students. Catholic Education in the Mareeba district began more than a century ago founded by the Sisters of Mercy who continued a long tradition of working with religious from the Order of Saint Augustine. The influence of our Parish Community was manifested in the early 1950s when our school previously known as Good Counsel, took the name of the patron of our Parish, St Thomas of Villanova. The work of the many religious who enriched the faith life of our community is recognised in the names of our school sports houses: Phelan and O'Connor, named after the two longest serving Augustinian priests and Power and Mills, named after the founding Sister of Mercy and our last serving Sister and Religious Principal. Information and Communication Technology has continued to be a priority at St Thomas' where 21st Century teaching and learning is increasingly evident. The renovated library includes flexible learning spaces with laptops, chromebooks and i-pads, which are well utilized by teachers who find flexible, innovative ways to use the digital resources available to them. The promotion of information literacy is viewed as critical as students use digital tools to support their learning. The G Suite (Google) is utilised by all teachers and students to communicate and collaborate for educational purposes. Students at St Thomas' have also had the opportunity to blog and contribute to wikis, which have been set up for a variety of educational purposes. Applications using mobile technologies such as i-pads, laptops and chromebooks have advanced over the recent past with many students benefiting from the multi-platform. I-pads and Chromebooks are stored in each year level and are used for a variety of purposes in class including: literacy and maths rotations. Such digital tools have engaged students and provided opportunities for differentiated lessons, thereby enhancing their learning, success and motivation. At St Thomas' School, teachers continually work towards improving our model of best practice. Best practice in this instance means - explicit teaching across all areas, allocation of more time to Numeracy and Literacy, provision of clear and relevant assessment to students, an analysis of synthetic phonics and a professional development review of teachers. The school offers students a sound academic education in all learning areas including Religious Education. Social/Emotional Education is an important part of daily routines with the whole school following the 'You Can Do It' Programme. Students have specialist lessons in Health and Physical Education and LOTE (Japanese). An education at St Thomas' is all about fun and exploration, rich learning experiences and developing positive emotions and connections. Excursions and Camps - Excursions and camps are a part of the school curriculum. All children are expected to participate in any class excursion/camp. Students in Year 5 attend a School Leadership Camp in Term Three. Student Representative Council - The SRC is made up by our school leaders, sport house captains and two class representatives from each Year 5 & 6 Class. Regular meetings which include following an agenda, minute-taking, correspondence and decision-making processes are held during lunch break. Readers Cup Challenge - Students in Years 5 and 6 are invited to nominate for selection for the the Far North Qld Regional Readers Cup Challenge, held in the month of June. The school selects a team of four students who attend the Challenge. Each student is required to read and learn the content focused on the selected reading texts chosen by the Readers Cup Organisers and provided by the school. Chess - St Thomas's has a chess coach enabling the students to have lessons in chess and also to compete in chess competitions. Mary Mills Cup - Girls in Year 5 & 6 are invited to participate in the Mary Mills Netball Championship, competing against opposing teams from Catholic primary schools within the Diocese. This occurs during Term 3. Jim Graham Cup - Boys in Year 5 & 6 are invited to participate in the Jim Graham Rugby League Championship competing against opposing teams from Catholic primary schools within the Diocese. This sporting opportunity also occurs during Term 3. School Band - A combined schools band has been developed with St Stephen's Catholic Secondary College. Students perform at various events throughout the year including the local ANZAC Day March, Dimbulah Lions Festival. Instrumental Music Program - Students are able to learn a musical instrument studying with a qualified music tutor. Some tuition takes place outside of the normal school timetable. Lessons in Woodwind, Percussion, Keyboard, Brass and Strings are available to students in the program. Guitar and Drum lessons are also offered. Fees for the Music Program are billed to families each term. Swimming Program - Swimming lessons for Prep to Year 3 students are held in Term Four and Years 4 to Year 6 in Term One. The objective of this program is primarily to raise students' water awareness and safety. Sporting Schools Program - As part of the Sporting Schools Program students participate in a quality, safe and fun after-school and in-school programs focusing on structured physical activity in organised sport such as: cricket, Auskick, soccer, netball, basketball and rugby league. Christ is at the centre of all of our endeavours. As a learning community joined together in faith we aim to bear witness to Christ's vision and values in all aspects of school life. All members of our school community (parents, students, staff and visitors) are called on to treat each other with respect and dignity in our relationships, through our words and actions. The religious dimension of the Catholic School is therefore present, to some degree, in all the activities of our school community as the resurrected Jesus lives through, with and in each of us in all of the events of our school day. Close communication with parents and the local Christian community is seen as vitally important to the effectiveness of the mission of our school. St Thomas' School is committed to taking action to protect students from bullying and to respond appropriately when bullying occurs and to inform the students on the nature of bullying. As a school, we aim to practise a 'zero tolerance' approach to bullying in all its forms. Our school and school community endorses the right to safety of all school community members. St Thomas' School is committed to ensuring that links are maintained with various agencies, organisations and groups within the wider community. Integral to the mission of St Thomas' Parish School is our commitment to supporting parents as the first and primary educators of their children. We assume the belief that schooling is a partnership operation. It is in working as partners - in supporting and encouraging each other's efforts that we benefit in bringing children to a genuine knowledge of themselves and of the world in which they live. Together it is hoped that efforts of co-operation and mutual support will complement each other through the sharing of a common vision and of common goals. This idea of partnership is lived out in many ways and evident on a daily basis. St Thomas' School is very fortunate to have access to a school counsellor, a full time learning support teacher and benefits greatly from regular contact with our community of clergy who live next door. St Thomas' recognises the importance of parents as the first educators of their children and actively encourages parental involvement. All parents are members of the school Parents and Friends Association. Family barbecues are organised by the Parents and Friends Association and have been very successful opportunities for families of students in each Year Level to meet and mix socially. These evenings also promote and celebrate the importance of families spending time and having fun together. In the spirit of community and valuing your child's education, parents are encouraged to take an active role in the life of the school through the P&F Committee. The P&F meet, usually the third Wednesday of each month at 5:30pm in the Staffroom. Our parents actively work to assist in improving student outcomes in a variety of roles. Parents help in classrooms by helping with literacy or maths groups, creating resources for classrooms and our library, collecting money from stallholders at the monthly Mareeba Markets, assisting in the tuckshop, assisting during swimming lessons and attending class excursions. Parents are also made to feel welcome at events such as Whole School and Year level Masses and liturgies, our School Swimming Carnival and Athletics' Day, Harmony Day, St Thomas of Villanova Feast Day, celebrations for NAIDOC Week, to parade with students on ANZAC Day and to attend weekly assemblies. Fortnightly newsletters keep parents informed and parents can download our school app and access alerts for any updates for calendar events or school news. Many of our parents report that they feel this school is a welcoming and caring community where everyone is treated with respect. Parents believe that St Thomas' promotes justice, compassion and service. Parents also agree that St Thomas' has a good reputation in our local community and would recommend the school to others. Parents also report that the school is meeting the academic needs of their child with teachers making learning fun and encouraging of children's efforts. Overall, our parents believe that their child is receiving an all rounded education in a stimulating environment at St Thomas'. Parents believe that St Thomas' School provides relevant information clearly and timely. Student Protection Issues - keeping teachers up-to-date with legal and protection issues, to ensure the safety and well-being of students. Social Emotional Learning - teacher skill levels in the "You Can Do It!" - ProgrammeAchieve - are sustained. Staff at St Thomas' live out Catholic values in their words and actions. Staff believe that St Thomas' School is well managed and organised and delivers quality educational outcomes for students. They feel valued and respected and believe that their skills are utilised effectively. Staff believe that the school is well-resourced and that they are given the resources that they need to do their job effectively. All staff strive to improve and innovate to enhance its educational offer to students. At St Thomas of Villanova School, parents are asked to contact the school by telephone or email on the day that a student is absent. If students are absent without notification and a pattern of non-attendance is developing, parents are contacted. The school also sends SMS Messages to advise parents if their son or daughter is marked absent (unexplained) or are recorded as arriving late to school without explanation. Our Learning Support Team and classroom teachers constantly monitor the results and use the data from assessment and tests in order to provide additional support to identified students. The staff of St Thomas' continues to refine and enhance the ways in which they assess students and report to parents. Classroom practice is reviewed, with continued improvement as a goal. We pride ourselves on tackling 'the basics' of literacy and numeracy well. The reporting procedure combined with parent teacher meetings, student progress reports and national tests (NAPLAN) provides a meaningful reporting format that accurately informs parents on the progress of their child. Alignment between our mission statement and school wide pedagogy has the effect of providing a safe, predictable and challenging learning environment for students to attain their potential. The school, both staff and students, will continue to develop its understanding and knowledge of the importance of well-developed spiritual, social and emotional intelligences. Alongside these important areas, students' work will continue to be guided by curriculum requirements, NAPLAN results, classroom-based assessment, Learning Support programmes and other school-based learning and teaching programmes. Other areas for development include the continued roll-out of the Australian Curriculum and the professional development for teachers in the use of ICTs in the classroom. The use of ICT in our school has multiple, interactive dimensions for both students and staff. Computers and other digital devices are used to assist learning in a variety of strategies to encourage and engage staff to develop new pedagogical skills and knowledge, in classroom delivery and curriculum content. It is our goal that both teachers and students make use of a variety of multimedia-based technologies to construct new meanings and communicate their learning to a variety of audiences. Students feel safe at St Thomas' School. The majority of students indicated that they are encouraged to set learning goals. They also agreed that their teachers give specific feedback about their learning and encourage them to learn from their mistakes. Students also appreciate that their teachers use learning intentions and success criteria as part of lessons. Technology is regularly used at school for learning and most students agree that teachers help when they experience a problem in their learning. Students also agree that when they experience problems in their learning, our teachers always help.